Daystar Counselors Present "Modern Parents, Vintage Values" on April 3 at Brentwood Academy | Williamson, Inc.
(BRENTWOOD, TN)—Daystar Ministry counselors will present a free parent workshop, “Modern Parents, Vintage Values” at Brentwood Academy on Wednesday, April 3 in the middle school from 7:00-9:00 PM. Free and open to the public, the seminar will help parents see how they can bring vintage values back into a modern world. 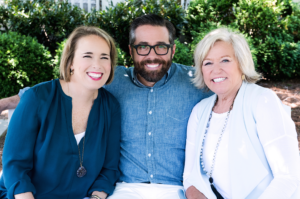 Daystar counselors Sissy Goff, David Thomas, and Melissa Trevathan, who co-authored the book by the same title, will lead the workshop on April 3. Daystar Counseling Ministries, located in Nashville, offers counseling to kids and families in the Middle Tennessee area. Daystar offers both individual and group counseling for children, adolescents, families, and young adults.